One of the most common problems faced by urban gardeners who want to deal with hydroponic crops is lack of light. Generally plants need very large amounts of light to grow which can only be given by very powerful and expensive lamps which also have the big draw back of consuming large amounts of power. The solution - now readily available - is to buy light emitting diode (LED) lamps to deal with a very efficient yet low consuming light source for your plants. 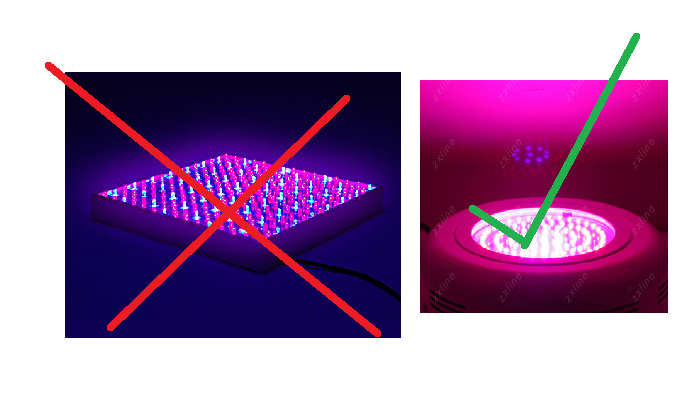 On today's post I want to talk to you about how you can choose your light emitting diode lamp for hydroponic growth and what lamps you should definitely avoid if you don't want your crop not to be a total failure. So what is so expensive about current lamps and so great about LEDS ? Currently the traditional way to supply artifical light to crops has been the use of full spectrum lamps which can be either tungsten metal halide or high pressure sodium (although sodium lamps have a much narrower spectrum). These lamps are very inefficient - wasting most of the power given to them as heat - and therefore consume great amounts of power. A high pressure sodium lamp (HPS) needs to consume about 400-700W to be able to sustain an average tomato plant. The truth is that most of this energy is wasted as heat and almost none of it (around 20-40W of light) are actually absorbed by the plant. Here is when LEDS come to save the day. Light emitting diodes are very efficient in generating light from electricity (wasting only a small fraction of the energy as heat) and they also provide light in very narrow ranges which can be tuned to only supply the wavelengths needed by plants. The reason why plants are green is because their main photosensitive pigment is chlorophyll (there are several types by the way), a pigment that absorbs red and blue wavelengths and reflects green. With this in mind - not only are LEDS able to supply your hydroponic plants witha higher efficiency - but they are also able to provide your plant with only the colors of light it needs. Achieving a double gain in efficiency. As a matter of fact, a LED lamp with just 60W is enough to grow a tomato plant. However, not all LEDS are created equal. Many people think that all LED lamps are the same and they end up buying cheap LED lamps or panels that simply do not provide plants with the energy they need to grow. There are generally two kinds of LEDS available for lamps. The first kind - low power LEDS - are the type of lights used to make your computer and keyboard lights. These lights are weak and they are usually sold in the forms of panels with HUNDREDS to make them appear "useful" for hydroponic growth. The second - high power LEDS - are lights used for traffic lights and high power applications and they ARE the type you need for hydroponic growth. In general, when you are looking to replace your TMH or HPS lamps with LEDs you need to look for high power LED lamps in the range of 50-100W for each 400W lamp you want to replace. You also need to look at the red to blue light ratio since different plant varieties need different proportions of light. If you are growing plants that need to have flowers then you will need to aim for a red to blue ratio of about 8:2 while plants that do not produce flowers may grow well with only red lights. This is - of course - a very course guide to the light color ratio but it may guide you well when you are looking for lamps for a certain crop. With this small guide and knowledge you will be able to eliminate most lamps that do not work and buy high power LED lamps that will deliver and provide you with a much more efficient, cooler and more eco-friendly way to provide your hydroponic crop with artificial light.